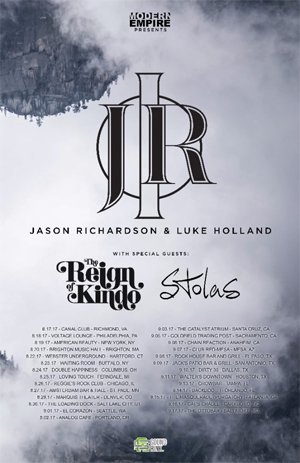 Guitarist Jason Richardson, formerly of ALL SHALL PERISH, BORN OF OSIRIS, and CHELSEA GRIN, is embarking on a headline tour this summer, playing with drummer Luke Holland. Special guest openers are THE REIGN OF KINDO and STOLAS. Dates are below. "I am insanely turbo excited to be out playing all of these songs," Richardson said. "Luke and I are going to be playing almost the entire album every night! Seriously, I can't wait to meet all of the fans and bring the best show possible. Neither of us thought we'd ever being touring off this album, so to be doing a headliner almost a year later is very humbling and we're gonna bring the sickest show possible." Richardson released his solo album I last July. At the time, he teamed up with Guitar World to premiere the official video for "Fragments", which featured Holland, Lukas Magyar of VEIL OF MAYA, and Mark Holcomb of PERIPHERY. Jason Richardson (born July 30, 1991) is one of the most noteworthy, young, and upcoming virtuosic guitar players to date. After being accepted to Berklee College of music and receiving a partial scholarship, Richardson had the opportunity during his senior year of high school to start touring the world at the young age of 17 with the metal band ALL SHALL PERISH. He took the opportunity dropping out of high school and hasn't turned back since. As time passed he went on to play/write with internationally touring metal bands such as BORN OF OSIRIS and CHELSEA GRIN. Having moved on from all those bands, Richardson is now pursuing a solo career. He successfully released his first album entitled I in July 2016. The entire album featured the talents of world renowned drummer Luke Holland, guest solos from many amazing guitarists such as Rick Graham, Nick Johnston, Mark Holcomb, PERIPHERY, Jacky Vincent of CRY VENOM, and Jeff Loomis of ARCH ENEMY. There are also two songs with vocal performances from Spencer Sotelo of PERIPHERY and Lukas Magyar of VEIL OF MAYA. I debuted at #1 on Billboard new artists/Heat Seekers charts, #2 on iTunes rock and #11 on all of iTunes with 7,200+ units sold worldwide in its first week. The album was crowd-funded, raising $33k+ and released independently with no label support.